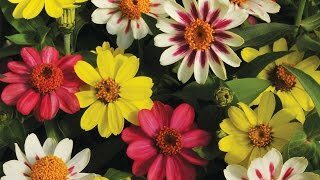 You have never encountered a dahlia like this, one that is sure to create a colorful commotion in your garden. From a single tuber will spring dozens of flowers of different colors! Each of the 4" flowers can be a different color, ranging from pure red, pure white, white with red stripes, red with white stripes or even pink flowers; it's 'Pot Luck'! The flamboyant flower show, from August until first frost, produces a steady supply of eye-catching and conversation-starting blooms for a vase. A hybrid annual grown from tuberous roots, this is a must-have addition to your cutting garden. For full sun and well-drained soil. Dahlia, Pot Luck is rated 2.0 out of 5 by 2. Rated 3 out of 5 by mmcc from Prolific blooms, a slack potluck This is more like a potluck where every guest brings chips and salsa - all of the flowers are either white or very lightly variegated with pink. Very pretty flowers, extremely prolific, on hardy bushes, but I would have liked to see the deep reds and pinks shown in the photo. Rated 1 out of 5 by JerseyGirlGardener from Deceived / Received Wrong Variety? I ordered this dahlia tuber variety because I loved what was advertised in the photo on this Burpee web site: shades of reds/ pinks in a pom-pom variety dahlia. I immediately potted the tubers I received as soon as they arrived indoors because I was so excited for spring to arrive & wanted to get a jump start on my gardens. Many, many weeks later, these dahlias are thriving at about 3ft tall, very bushy with an average of 3-1/2" - 4" diameter blooms. Except that they ARE NOT at all the Pot Luck Dahlias that are pictured - I have no clue what variety they are! They are quite pretty enough, with lovely shades of purple. Perhaps with a name of "Pot Luck" I should have not had any expectation of the dahlia I was shipped to match any picture. I'd rate this product a 5-star item, if the item I received was what I thought I bought - and for that reason, I can only give 1-star (should really be NO star). I'm highly disappointed in Burpee, as well known as they are, for their total, blatant false advertisement. And I'm equally disappointed not knowing the real name of this dahlia variety. Shame on you, Burpee!